Cold Steel's Recon 1 could be considered by some to be the most rugged and indestructible knife ever. It offers a 4" AUS-8A stainless steel blade coated with black Teflon for corrosion resistance. 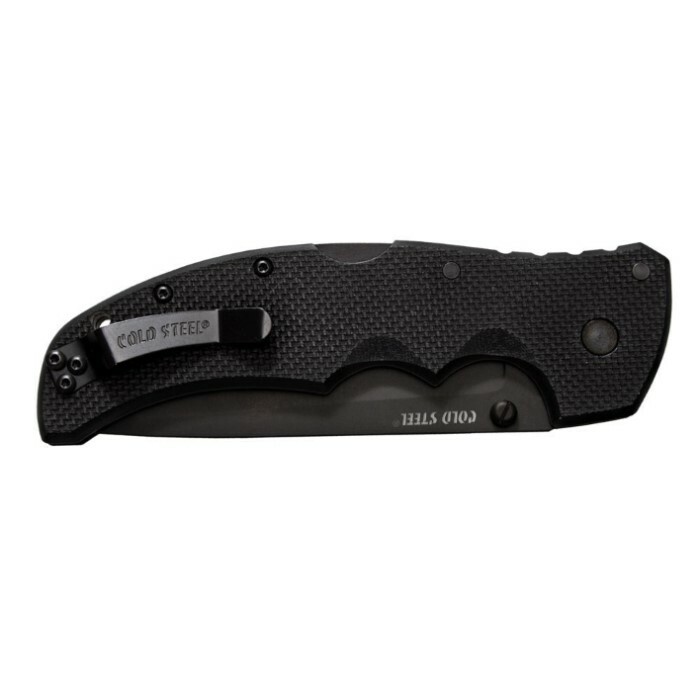 This knife offers tough G10 handle scales and a pocket clip. 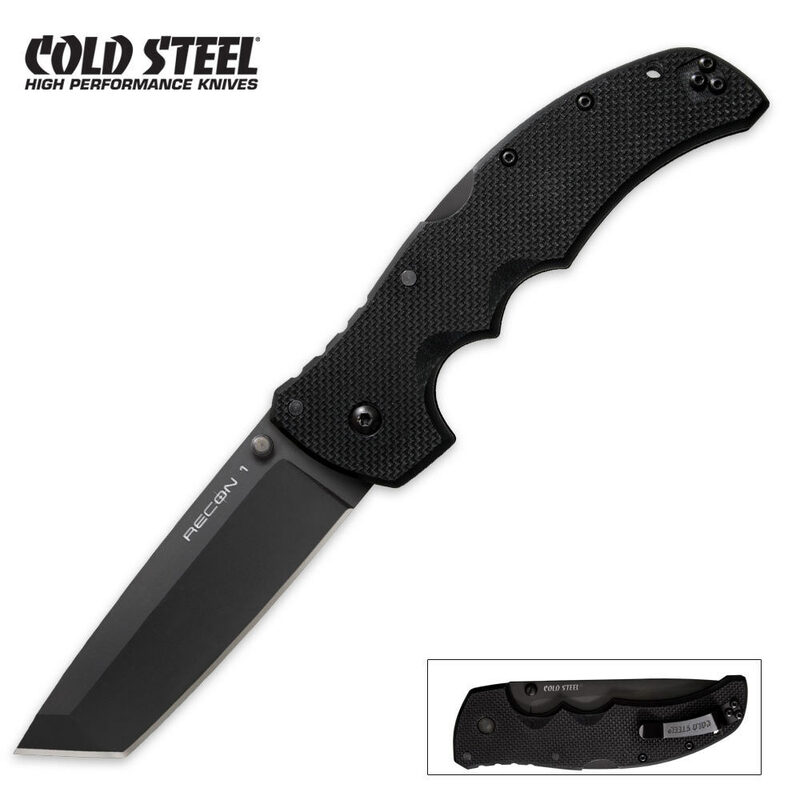 The huge tactical blade is held open with Cold Steel's patented Tri-Ad lock mechanism that holds up to 150 pounds of weight. Great knife, amazing edge. Very light weight. great for a backup E.D.C. OH MY FREAKING GOSH, THIS BLADE IS SO GOOD! It is well worth more than TrueSwords' price. I cannot speak highly enough of this knife. It is perfect. I have had it for over half a year now, and it has held its edge. It is still as strong as ever, and is still my every day carry. The only ever so slight signs of wear that can be seen are a few places on the corners of the back of the blade where the black finish has slightly worn off. And it didn't just wear off over time, it was scraped off by being worn on the outside of my pocket and occasionally being knocked against hard objects. And again, the only wearing of the finish is on the very corners of the back of the blade, the corners where the back of the blade becomes the side of the blade. The wear is so fine and minute that you can only see the shiny metal that is exposed if you look at it from the correct angle that allows a shiny reflection to appear. Don't let my description make you think the finish could come off easily; I only go into so much detail because, I kid you not, that is the ONLY sign of wear on the entire knife after over seven months of constantly being on my person, and it is hardly visible at all. This knife is amazing, and TrueSwords has the best price. Buy it, please, for your own good!